The battle feild had been set for the two contestants who currantly stood up within the huge and vast amount of branches within the Forest of Death. The rain heavily showerd down onto the battle feild making all the branches and trees wet and slippery. It was a clear day but the sun light could hardly been seen through the thick branches of the forest. Uzumaki Naruto, one of the contestants stude tall, confident and ready as he looked into the eyes of Temari. Wearing the same cloak as his father the 4th Hokage just different colors over his usual clothing, a scroll was attached to the bottom of his back. His arms were crossed and there was an expression of seriousness on his face. "I'm going to warn you Temari. Just because I know you doesnt mean I'm going to go easy on you. So.... Are you ready?" It was the first fight for Temari, and already her luck was up. She was against the nine tails, otherwise known as Uzumaki Naruto. Standing the forest known as the forest of death where the chuunin exams had been held, it was rainning hard but the sun was out. But because of the over sized trees and the clouds from the rain, the sun could hardly be seen. Temari stood ther looking at naruto with her fan strapped on her back. Hearing Naruto speak, she would first say to herself " this just is not my day." Then she would say to Naruto while pulling her fan off of her back "dont worry Naruto, i was not intending on going easy on you either. I may be a girl, but it does not mean i can't pack a punch" and smiles. Opening up her massive fan, she would grab it with both hands while yelling as she gave it one swing releasing a massve wind storm towards Naruto's dirrection. 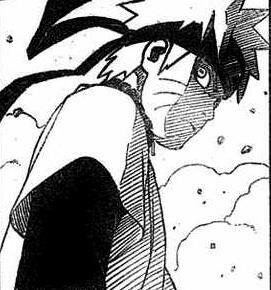 Naruto still stood there with his arms crossed and watched as Temari spoke to him. His facial expression never changing, it would remain serious and ready. It seemed that Temari was realy eager to begin the battle and made a swift move by shooting one of her famous blasts of wind with her tool. Swiftly jumping upwards Naruto would spin around in the air and land on the branch above him with the soles of his feet. Sticking to the branch having dodged the blast of wind, Naruto would perform a deranged hand seal and there would be a small explossion of smoke around him. Jumping out of the smoke would be Naruto holding a Fumma Shuriken. Soaring through the air Naruto would launch the Fumma Shuriken towards Temari full speed. As it spun towards her Naruto would perform yet another one of those hand seals as there was another explossion of smoke that errupted around him while he was still soaring through the air. Falling down he would move out of the smoke cloud. Now there would be one Naruto standing ontop of the other one. The Naruto that stood on the other one would use him as a sling shot and jumped right off of him. Bouncing right off of a tree with much greater speed then when he had last met Temari, Naruto would head strait towards Temari's right side and swung his left first forward right for her cheek bone.